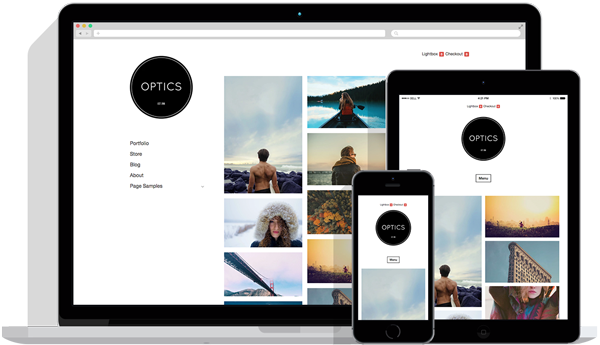 f8 static is a free theme for WordPress that can transform your Web site or blog into a fully functioning photography or multimedia portfolio Web site. SEO optimized, iPhone compatible, grid-based css, built-in Galleria support, built-in multimedia support, auto or manual thumbnail control, Gravatars, plus much, much more. The credit link is required to stay in tact. This entry was posted in Themes and tagged free, portfolio, theme. Bookmark the permalink. To download this theme, you need to sign up for a free or paid account. Yikes. Extra blanks spaces in a few core WordPress files caused a brief blip in service. Sorry! What a nicely-designed template. Thank you for supplying it free of charge. I’m wondering: is it possible to modify the template to make the images on the main page the standard 3:2 aspect ratio of a DSLR? I’d love this theme even more if it didn’t crop my pictures. Hi. Do I need to have f8 installed for f8 static to work? Cool theme I like it too!!! do you really need to have a landscape photo on your post to look nice on the front page slideshow. What can I do to make it work for any size of photos in order to have it right in the slideshow? I ony think that header picture is too high. It actually makes to to scrool on resolutions x800. Anything under the scroll border is less noticable and therefore less visitable. Can’t download… it just keeps redirecting me to the sign up for a membership even though I already made an account. Any suggestions? Hello. My Name Xell. i already download f8 static. But i still can’t use it perfectly.. Can someone teach me? I tried to install f8-static but WP says it is incomplete: Stylesheet is missing. I could not get the downlaod to work either. Will this theme work in WordPress 2.8? Also, if the credit link is intact, do you mind if we customize this theme? Try a different program for unzipping the package. Yes. F8-Lite works with 2.8. Feel free to customize the theme as you wish. Thanks for this, very helpful. Nice site by the way, keep it up, hope to hear more from you soon. F8 Static is working well for me. A couple of questions, though: 1) Is Static compatible with WordPress 2.8? ; and 2) I would like to add a custom icon in the address bar – where would I need to add this code? Nice post. This post is different from what I read on most blog. And it have so many good things to learn. Thank you for your sharing! The navigation bar has “portfolio”. How do I populate it? How do I navigate to the contents of that tab? Having same problem with Deadwood, in addition to F8. I am having the same problem as Brambert! I found that if when I set my permalinks settings to default instead of custom. The problem was solved. Do you have some tips on modifying the masthead? Great theme and thank you. How do I get the front page to stop rotating pictures on the homepage. I have already tried the “Static” settings in the “Settings area of WordPress, but it doesn’t work the way I want it to. 2. F8 Static: with a general pic as a masthead (not a post pic) and with no text blurb to the right. So for both issues that I have, I just want a general masthead there that will never change no matter how many posts I add. Thank you in advance to whoever helps me. Theme looks good. Stopped working on travel.goutdelavie.com. Can’t load images anymore. Too bad. I reinstalled a dozen times! http://fotos.encantado.net/ why can’t I get the images to work? After trying, i realized that i have to put a custom field with the name “image” and the url of the image that i want to show in the post at the top (the image large) and a custom field with the name “thumbnail” and the url of the image for the posts below the principal post. Hello, I’m using the theme Modularity and F8 Static chiro change. There are some tutorials on how to change colors, logo, etc… ?? Hi! Ivé downloaded this theme…and installed it Ok (several times). Problem is when activated I get an error page when visiting the blog and need to start from scratch and re-install my whole blog…and clear my php-database! This has happened 2 times already and I´ve lost a lot of time over this. Now…what am I doing wrong? I am thinking of bying a theme from you…but I want to try static first. F8-lite works ok, but not static. hi there – downloaded this and love it, a really interesting and refreshing design. Only problem is that the thumbnail images appear stretched, have I done something wrnog here? Waiting to launch the page once this is resolved. 2) Is there a way to have no text appear below those same thumbnails. Any help would be greatly appreciated…thanks! anybody know how this works? Hi, for some reason the slideshow ends up stacking on top of itself using IE 8 on vista sp2. Looking forward to a fix! I’ve downloaded this theme and love the look and feel of it. Is there a way to limit lines that appear on blog posts at Home? I only want 2 lines to be appeared on each post at the front page. Will dowload it adn test it on my own site to see how it works. But from quick peek at it it sure looks impresive. Why is it impossible to download any theme ? that’s not very professional..
Why can’t I find f8-static on the word press control panel? Why can’t I find f8-static on the wp control panel, so I to activate? Hi, thanks for this theme. Exactely what I was looking for. Goes quite well with the design of my prestashop design. I use it with WPML. Does your theme allow this kind of translation? Can’t get the translation of the home page. Anybody had the same problem and found a solution? I’ve installed F8 static theme. Very Nice. How can I have the customisation option Page on the DashBoard? Do i need upgrade my account? Hey, I tried installing F8-static on my hostgator/wordpress account and it says its a broken theme and that the css, images, and js style sheets are missing. What’s up with that? When I downloaded f8 – static, I do not have the “theme options” so i can customize, how do i go about getting this? is it a plugin?